YANTRA (TALISMAN) - DOES IT WORK? ॥ ओं ......... मम प्राणः मम जीवः वाग्मनः श्रोत्रजिह्वाघ्राणैः उच्छ्वासरोपेण बहिरागत्य अस्मिन् बिंबे अस्मिन् कलशे अस्यां प्रतिमायाम् सुखेन चिरं तिष्ठंतु॥ "I invoke the God in the picture (or yantra or rangoli - a drawing) or kalasha (a pot filled with water and mango/betel leaves) or an idol". The yantras are identical with the idols. Yantras have more representation as they have the drawing of the beeja mantra etc., which represent God as many descriptions and related things are inscribed on the yantra. It is not necessary that one should worship only the yantras. If you find it easy to concentrate or if certain idol kindles love and respect for God, you can worship the same. Yantras are mysterious geometrical drawings engraved on metal plates. It is not necessary that all the yantras should be only on silver or gold. It is only for the sake of fashion. Copper yantras are equal to any gold ones. These are not as costly as gem stones and do not have any side effects if a wrong one (for any planet) is selected. It is also true, yantras should be looked after properly - doing some pooja in whatever manner you like. Otherwise, they loose power. 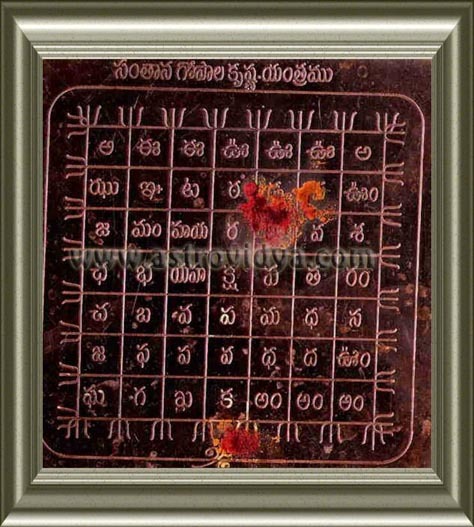 On the engraved plates you find beeja mantras of the deity. Yantras should first of all, be invoked with the Deity. 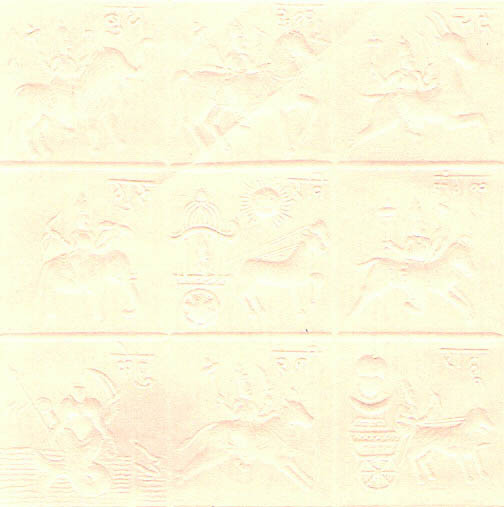 In case you purchase any yantra, you can do it yourself, if you know those mantras. I am not so called 'son of God' or any God-man who has taken up a contract or agency with God. I prepare the yantras with the relevant mantras. Mantras having anudatta, udatta (methods of pronunciation) should be recited in the proper method only. Namaskara mantras of navagrahas can be recited without any restrictions-any time any where. Any mantra (for that matter a prayer repeated with devotion several times) will get strength. Jesus said, "When two people gather in my name, I will be there among them." Yantras are mysterious geometrical drawings engraved on metal plates. It is not necessary that yantras should be only on silver or gold. It is only for the sake of fashion. Copper yantras are equal to any gold ones. These are not as costly as gem stones and do not have any side effects if a wrong one (for any planet) is selected. It is also true, yantras should be looked after properly - doing some pooja in whatever manner you like. Otherwise, they loose power. 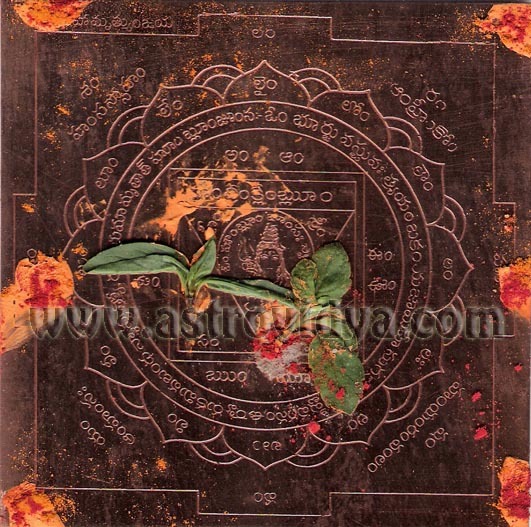 On the engraved plates you find beeja mantras of the deity. Yantras should first of all, be invoked with the Deity. In case you purchase any yantra, you can do it yourself, if you know those mantras. I am not so called 'son of God' or any God-man who has taken up a contract or agency with God. One can prepare yantras with relevant mantras. Mantras having anudatta, udatta (methods of pronunciation) should be recited in the proper method only. Namaskara mantras of navagrahas can be recited without any restrictions-any time any where. Any mantra (for that matter a prayer repeated with devotion several times) will get strength. Jesus said, "When two people gather in my name, I will be there among them." 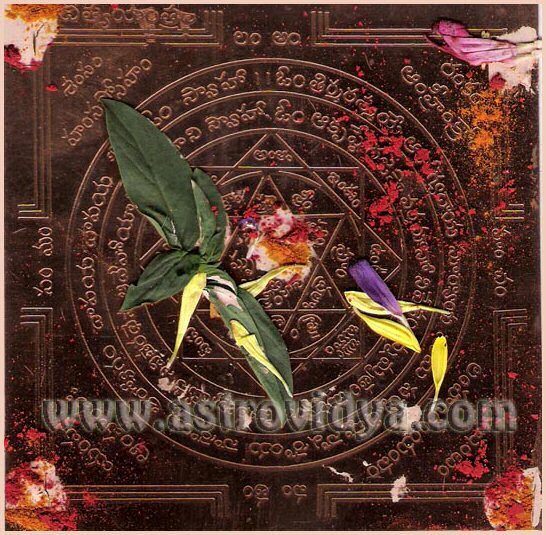 There are specific mantras for invoking the deity of the yantras. After, this shodhasha pooja (sixteen varieties of pooja) with abhisheka (bathing with panchamrita - milk, curds, ghee, honey, sugar) is done. This yantra requires a sankalpa (commandment) that " I am doing on behalf of so and so for that particular purpose on this day". You should mention name (for whom the yantra is required), father's name, gotra (family name), star and purpose for which the yantra is required in the sankalpa. Then shodhashopacharaya pooja (sixteen varieties of pooja) with abhisheka (bathing with panchamrita - milk, curds, ghee, honey, sugar) should be done. Yantras for personal ware can also be prepared on similar lines. It is always better to purchase the yantras which are duly invoked and worshipped. Ravi Yantra: Ravi rules over heart, soul and dignity. Ravi governs eye sight, influence in society, popularity, heart and relationship with father or higher officers. Ravi afflicted will cause hot diseases, humiliation, wrath of the ruler or government. As ravi is a cruel planet, he causes rifts with the people represented by the house. He also confers highest offices in the government. A strong ravi in the chart makes the native an able administrator. When in debilitation sign Libra, he would cause imprisonment, humiliations, severe circulation problems, neurological and eye related problems, loss of or loss due to father. Those who have Ravi in Capricorn, Aquarius, Libra, ravi owning or placed in bad houses and who have 6 to 8 relationship with the present dasa lord should worship ravi yantra. Ravi bestows abundant energy, royal favours, high posit ion in the government, clear thinking, ability to recite mantras with correct pronunciation, great popularity among masses. The worship of this yantra should start on Sunday. The mantra ॥ओं ह्रां ह्रीं ह्रौं सः आदित्याय नमः॥ for ravi ("OM HRAAM HREEM HROUM SAHA AADITYAYA NAMAHA") is to be chanted on Sunday morning at sunrise minimum 18 times. The worship of the yantra is similar to any worship of Gods say Ganeshji. It is not black magic. Chandra Yantra: Chandra rules over eyes and mind. Chandra governs impregnation, conception, child birth, infancy. Badly disposed Chandra causes ill health to the infants (called balarista) and also pre and post delivery problems to the mother. Water related diseases like cold diseases (throat troubles, asthma, bronchitis etc.,) vomiting, Mental problems (fickle mindedness, anxiety neurosis, depression, mysterious fear and pessimistic nature, poor concentration, hysteria, insanity, drifting of interest), infatuation with opposite gender, lack of commitment, eye disorders, varicose veins, audition to drinks an drugs. Those who are having Chandra in the worst placement Chandra in vrischika rasi or having the ownership over bad houses or Chandra being in 6 to 8 relationship with the present dasa lord should worship Chandra yantra. For the blessings of Chandra one worship this yantra. Chandra bestows mental tranquility, good child birth, relief from cold and mental problems, promotions and for linguistic and artistic talents. The worship of this yantra should start on Monday. The mantra॥ओं श्रां श्रीं श्रौं सः चंद्राय नमः॥ for chandra ("OM SHRAAM SHREEM SHROUM SAHA CHANDRAAAYA NAMAHA") is to be chanted on Monday morning at sunrise minimum 18 times. Kuja Yantra: Kuja represents martial arts, engineering skills, policing, army and communication skills. Depending on the position of kuja, the nature of energy he gives changes. Kuja rules over animal instincts. A kuja having good nature and strength gives self-confidence, tolerance, mathematical and logical mind, quick wit. He gives muscular strength for a sports man. Leadership, strong determination are given by kuja. A bad kuja makes the native a foolishly argumentative person, adamant, quarrelsome and violent. Kuja in bad houses or in kataka rasi will cause bad effect. There would be troubles through machines, tools and brothers/sisters of the native. The diseases that are caused by kuja are: burns, inflammatory conditions, wounds, abortions, ulcers, boils etc., Such a native would be at the extremes and would behave like an animal. 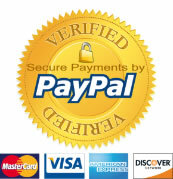 Kuja is the significator of loans and a bad kuja would cause severe liabilities. Kuja in the 2nd, 4th, 7th, 8th and 12th houses from lagna, chandra and sukra would cause Kuja dosha (Chavai dosha). South India is famous for Malasa Dossa and Chavai dos(h)sa! Undue importance is being given to kuja dosha than needed. If kuja in in own sign or exalted or if he is yogakaraka or if he is the lord over rasi/lagna or the 7th house, the chart is EXEMPT from kuja dosha. Kuja dosha from lagna is more strong than the other two factors. 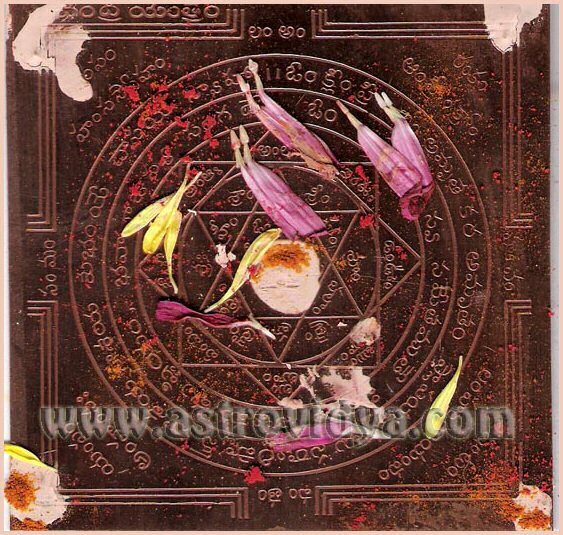 Normally, kuja dosha is looked in the charts of the girls and not boys, as if the boys are above the planets! Another blunder that is being committed is to match the chart for "dosha samya" (equal flaws) in the charts of girl and the boy. The argument is that if both have kuja dosha, the marriage will not be affected. Two thieves put together do not make a policeman! Those who are having kuja in above conditions or in 6 to 8 relationship with the present dasha lord should worship kuja yantra. The worship of this yantra should start on Tuesday. The mantra for kuja ॥ओं क्रां क्रीं क्रौं सः भौमाय नमः॥ ("OM KRAAM KREEM KROUM SAHA BHOUMAAYA NAMAHA") is to be chanted on Tuesday morning at sunrise minimum 18 times. Budha Yantra: Budha rules nervous system and skin. Wit, intelligence and quickness in grasping the subjects are due to budha. A person with a strong budha can learn almost anything without a teacher due to his inquisitive nature. Worship of budha yantra gives intelligence, literary talents, administrative capabilities and success in agency work. A badly disposed budha in the evil houses or in meena rasi or owning bad houses gives argumentative nature, gambling and cunning tendencies, self-praising mentality. Such a position of budha gives laziness, diseases of nervous system, madness, stammering, depression, speech defects, skin problems, tuberculosis. The worship of this yantra should start on Wednesday. The mantra for budha ॥ओं ब्रां ब्रीं ब्रौं सः बुधाय नमः॥ ("OM BRAAM BREEM BROUM SAHA BUDHAAYA NAMAHA") is to be chanted on Wednesday morning at sunrise minimum 18 times. Guru Yantra: Guru makes a man generous. He will be having social concern, un diplomatic and candid. Wisdom, patience, high reasoning ability particularly in abstract subjects, ability to judge the situations and persons impartially are due to good disposition of guru. Law, religion, social service, education are represented by a strong guru. A strong guru bless the natives with good children. Afflicted guru makes the person fundamentalist. A badly placed guru in makara or in bad houses or owning bad houses causes liver problems, jaundice, lower back aches, gastric problems, glandular malfunctions and problems due to children or bareness. Worship of guru yantra gives wisdom, professional higher education, good digestive power, success in professions involving analytical ability, social concern and blesses the worshipper with good children. ॥ओं ग्रां ग्रीं ग्रौं सः गुरवे नमः॥ The worship of this yantra should start on Thursday. The mantra for guru ("OM GRAAM GREEM GROUM SAHA GURAVE NAMAHA") is to be chanted on Thursday morning at sunrise minimum 18 times. Shukra Yantra: Shukra gives power of love, affection, fine arts, beauty and comforts. For wealth, poetical and artistic talents sukra is the presiding deity. Beautiful personality, melodious voice, attraction by and towards opposite gender and amusements in life are bestowed by shukra. A badly situated shukra in kanya or in bad houses or owning bad houses causes drunkenness, womanizing nature, stones in urinary bladder, female disorders, over indulgence in eating, drinking and other pleasures, diabetes, vehicular accidents and injuries and infidelity. Worship of shukra yantra removes the evil results and bestows political power, money power and also all riches. The worship of this yantra should start on Friday. The mantra for shukra ॥ओं द्रां द्रीं द्रौं सः शुक्राय नमः॥ ("OM DRAAM DHREEM DHROUM SAHA SUKRAYA NAMAHA") is to be chanted on Friday morning at sunrise minimum 18 times. Shani Yantra: Shani causes losses, failures and humiliations, dental or bone related problems, sudden accidents that result in fractures as well as relationship problems. He also protracts the diseases, litigations for considerable time. He humbles the person but it is not that he imposes penalties without discretion. It is common knowledge that even remedial measures for Shani does not take off easily. Lord Shani should himself permit to do so! Either due to ignorance or wishful thinking, many would be reluctant to workshop Shani in the beginning of the problems. Ardastama shani (Shani in 4th from rasi), Saptama (in 7th), Astama (in 8th) and seven and half year cycle of Shani (in 12-1-2 from rasi) and whenever Shani Dasha /Bhukti is going on, it is desirable to worship Shani yantra. The intensity of problems as well as the outcome of remedial measures depends on the role of Shani in the natal chart like lordship and placement. Worship of shani yantra removes all the above problems, restores stability in life and gives good life span. The worship of this yantra should start on Saturday. The mantra for Shani ॥ओं प्रां प्रीं प्रौं सः शनैश्चराय नमः॥ (" OM PRAAM BPREEM PROUM SAHA SHANISHCHARAYA NAMAHA") is to be chanted on Saturday morning at sunrise minimum 18 times. Rahu Yantra: Vedic scholars well aware that there is no planet by name Rahu. Without telescopes they were able to time the eclipses and rahu swallowing ravi or chandra is merely a poetical expression. Rahu is called shadowy planet. Rahu causes suddenness of the things. Explosion, burns, snake bites, poisoning and also bites by wild beasts, violent mind and caused due to rahu. It also causes divorce, separation, loss of money due to thefts and cheating, diseases that are difficult to diagnose and hidden enemies. Those people who have rahu in 2nd, 4th, 5th, 7th, 8th and 11th should worship rahu yantra. The worship of this yantra should start on Saturday. The mantra for rahu ॥ओं भ्रां भ्रीं भ्रौं सः राहवे नमः॥ ("OM BHRAAM BHREEM BHROUM SAHA RAAHAVE NAMAHA") is to be chanted on Saturday morning at sunrise minimum 18 times. Ketu Yantra : Vedic scholars well aware that there is no planet by name Rahu. Without telescopes they were able to time the eclipses and ketu swallowing ravi or chandra is merely a poetical expression. Ketu is also called shadowy planet, chayagraha. Ketu is also of malefic nature but he is not as malefic as Rahu. Further, the problems inflicted by ketu make the person spiritually rich. Ketu also causes sudden turn of events but they are somewhat anticipated or taken as 'expected behavior'. Skin and viral diseases, worms in the intestines, insect bites like scorpions, centipedes, food poisoning and also bites by canines and rodents, are attributed to ketu. It also causes divorce, separation, loss of money due to thefts and cheating, diseases that are difficult to diagnose and hidden enemies. Those people who have ketu in 2nd, 4th, 5th, 7th, 8th and 11th should worship rahu yantra. Ketu yantra helps spiritual growth and bestows victory over enemies, favour from government and cure from diseases caused by ketu. The worship of this yantra should start on Tuesday. The mantra for ketu ॥ओं स्त्रां स्त्रीं स्त्रौं सः केतवे नमः॥ ("OM STHRAAM STHREEM STHROUM SAHA KETAVE NAMAHA") is to be chanted on Tuesday morning at sunrise minimum 18 times. 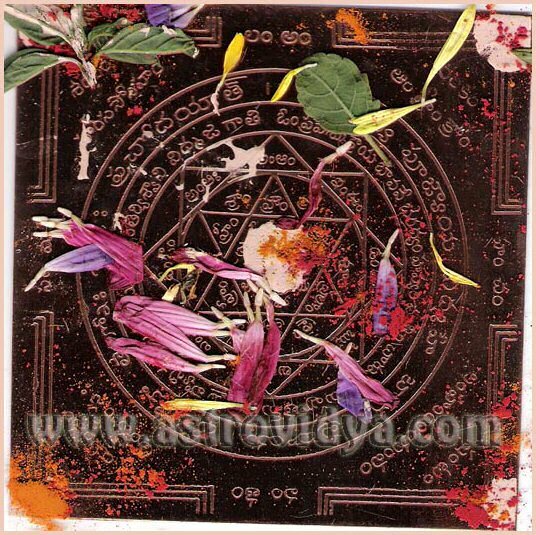 Maha Mrityunjaya Yantra: Mrityunjaya means the one who has conquered the death. This is another name of Lord Shiva, one of the trinities concerned with end. 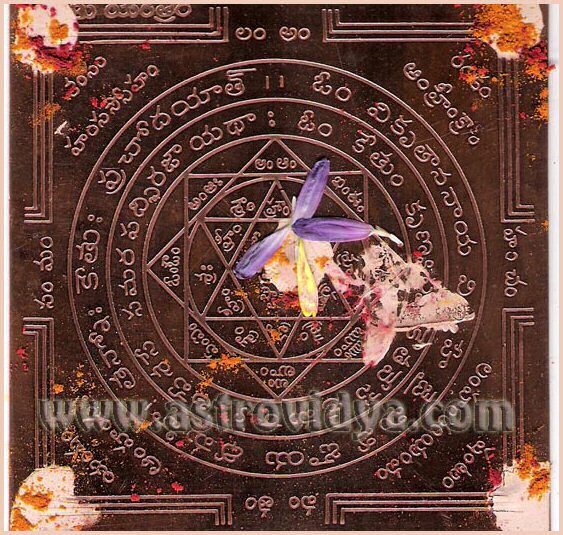 This Yantra particularly relieves one from all dreadful diseases. humiliations or any problem which is equal to death. It dispels all sorts of fears, influence of evil spirits, curses, accidents etc. The worship of this yantra should start on Saturday. The mantra ओं त्र्यंबकम् यजामहे सुगन्धिम् पुष्टिवर्धनम्।उर्वारुकमिव बंधनात् मृत्योर्मुक्षीय मामृतात्॥ ("OM TRIYANBAKAM YAJAMAHE SUDHANSHIM PUSHTIVARDHANAM; URVARUKAMIVA BANDHANAAN MRITYOR MUKSHEEA MA AMRITAAT") is to be chanted on Saturday morning at sunrise minimum 18 times. Lakshmi Nrusimha Yantra: After eliminating the demon king Hiranyakashapu, Maha Vishnu in the form of half lion and half human was still in angry mood. To pacify the Lord, the Gods made His divine wife, Mahalakshmi to sit on his lap. Lakshminrusimha Yantra represent that mood of God which is rajasika. When a humble servant is injured, he seeks justice and appeals to God for protection. 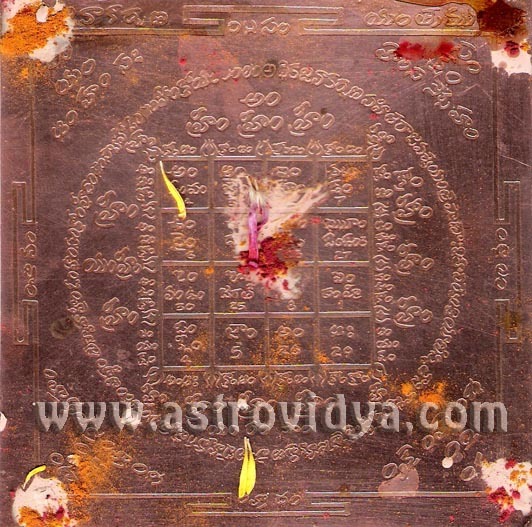 This yantra is used as protection against humiliations and tabulations. The worship of this yantra should start on Thursday. The mantra ओं वज्रनखाय विद्महे तीक्ष्णदंगष्ट्राय धीमहि। तन्नो नारसिंह प्रचोदयात्॥ ("OM VAJRANAKHAAYA VIDMHE TEEKSHNA DANGASHTRAAYA DHEEMAHI; TANNO NAARASIMHA PRACHODAYAT") is to be chanted on Thursday morning at sunrise minimum 18 times. 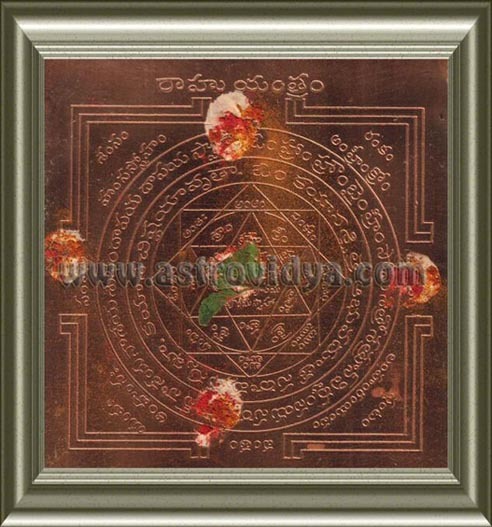 Mahalakshmi Yantra: Mahalakshmi Yantra is intended for wealth of all kind and attaining comforts in life. Mahalakshmi Yantra brings success and wealth through regular puja and mantra chanting. The worship of this yantra should start on Friday. The mantra ओं महादेव्यै च विद्महे विष्णुपत्नै च धीमहि। तन्नो लक्षी प्रचोदयात्॥ ("OM MAHADEVYA CHA VIDHMAHE VISHNUPATNAY CHA DHEEMAHI; TANNO LAKSHMI PRADHODAYAAT") is to be chanted on Friday morning at sunrise minimum 18 times. 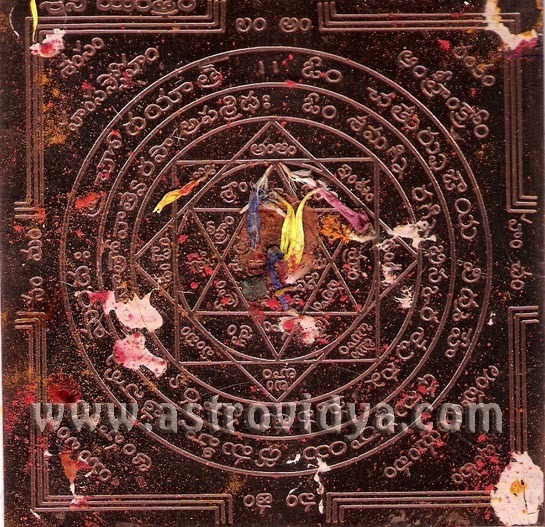 Janakarshana Yantra: Janakarshana Yantra is not intended to attract a particular person into partnership or marriage. 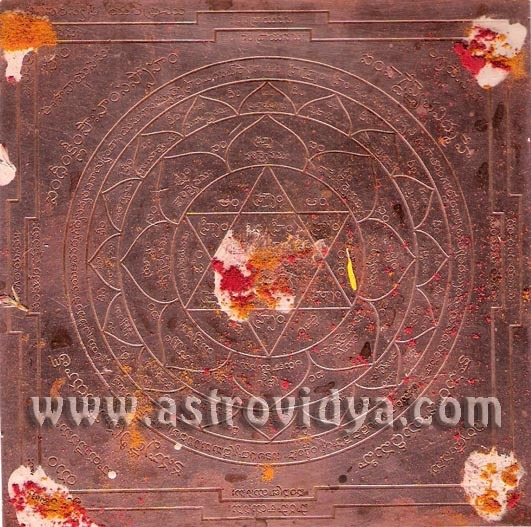 This yantra gives attraction and charisma in public life. 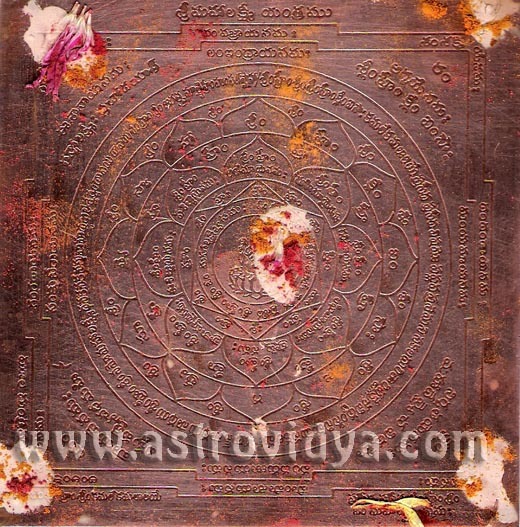 The purpose of this yantra is to get recognition and turnover in business. It is believed that Shri Sankara Bhagawatpada installed Janakarshana Yantra at Srirangam, Dhanakarshana Yantra at Tirupati. 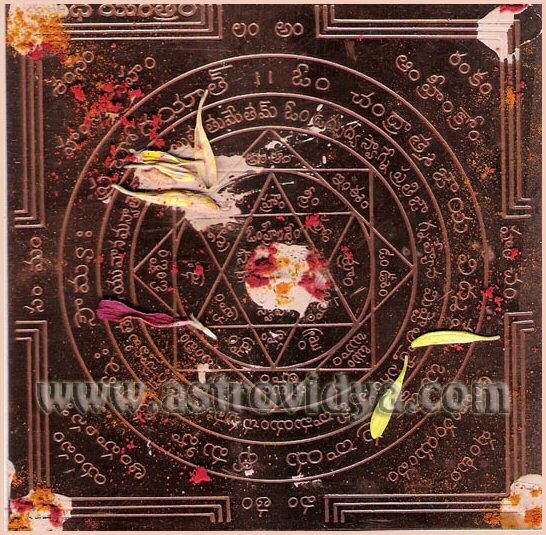 My grand father, Sri Nrusimha Murthi Jois used to worship this yantra on Sundays before dispensing to his clients. He used to recite ravi beeja mantra 108 times and use ravi avahana mantra to invoke this yantra. Santana Gopala Yantra: Santana Gopala Yantra is very useful for getting a child and a safe progeny. This yantra also prevents miscarriages. The presiding deity of this yantra is Sri Krishna. The worship of this yantra should start on Thursday. The mantra देवकीसुत गोविंद वासुदेव जगत्पते। देहिमे तनयं कृष्णा त्वामहम् शरणंगतः॥ ("OM DEVAKISUTA GOVINDA VASUDEVA JAGATPATE; DEHIME TANAYAM KRUSHNA TWAMAHAM SHARANAM GATAHA") is to be chanted on Thursday morning at sunrise minimum 18 times. Saraswati Yantra : Saraswati yantra is used for attaining knowledge, success in education, literary skills and for good oratory. Goddess Saraswati is the presiding deity of this yantra. 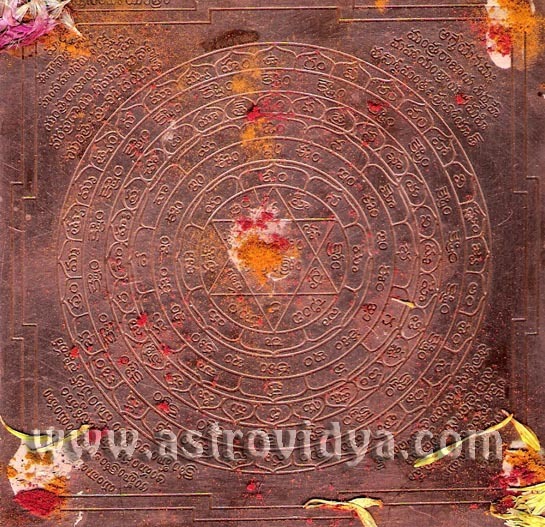 By constant worship of this yantra one becomes learned, famous and earns admiration from all. The worship of this yantra may start any day. The mantra प्रणो देवि सरस्वति वाजॆभिर्वाजिनीवती। धीनामवृत्यवतु॥ ("OM PRANO DEVI SARASWATHI VAJEBHIRVAJINEEVATI DHINAMAVRITYAVATU") is to be chanted in the morning at sunrise minimum 18 times. I used to prepare these yantras exactly as per the procedure long ago but now, due to paucity of time (much of my time is spent astrological activities, yoga, pooja and studies. Also, due to aging I can not sit in the squatting position for a long time. So, the wise readers may approach temples and ashramas who prepare these yantras. But do not ever purchase a yantra costing 25000/- INR with a special discount of 90%, which you can keep in your car or shoe rack, as per the TV commercial! Mantras and shanti kriya are the points of dispute. There are prayers in every religion. Muslims gather in masses and conduct prayers for the rain. Christians conduct mass healing prayers. Large number of miracles through such prayer meetings are from Philippines. A committee consisting of qualified doctors as well as missionaries conducted investigation and found that not all 1000 miracles did happen. It is not that all of them were faked but they found medical explanations. There was no concrete proof that prayers work. In an experiment one group was let known that they were being prayed for. These people showed speedy recovery. In the other group the patients participated in such prayers and the recovery rate was even good. In the third group there was no recovery at all - though they too were being prayed for! This means the person for whom the prayers (shanti, worship, pooja etc.,) are conducted should be able to receive the benefits. By prayers what we seek is a miracle - a concession. It is up to Him either to grant or not. Even after putting our wish list to God, we better give Him a free hand - Thy will be done. In Hindu worship, the pooja ends with ". श्रीमन्नारायणेति समर्पयामि" We do not put a demand but surrender to God. Incidentally, recent statistics in April, 2013 showed that mental illness in religious persons are more! The followers of cults and modern schools showed traits of mental illness but the followers of well established religions like Hinduism, Islam, Christianity, Jainism or Buddhism etc., did not show this tendency. The conventional religions have many clusters of ideas and are able to support you when you are in distress, which is not the case with the modern schools. They are half baked, raw and ill formed, they simply put a pyramid, a Buddha some air into your spiritual yearning. You have lived for long time successfully and they teach you 'Heart of Living' than the Heart of Loving! Did not He run away from cyclone hit area, afraid of his own life that one more cyclone was on its way? (it is just a gossip). Due to our firm faith to the God incarnate ('there is glow of innocence in his eyes'), we refuse to believe the reports of PTI and UNI news agencies. Even those who read these things, simply bury the current affairs into old history sheets! The more Sri Mad Acharya constructs palatial buildings on leased or grabbed lands (it does not matter), the more funds he gets to grow, even from the UN! Keep away from such schools and also from the babas who claim to solve your problems in 48 hours with some ashes or those mathematicians who swallowed silver Ganesh idol in their young age, still stuck up in their guts!